This was originally posted on my site, read it there for the best experience! 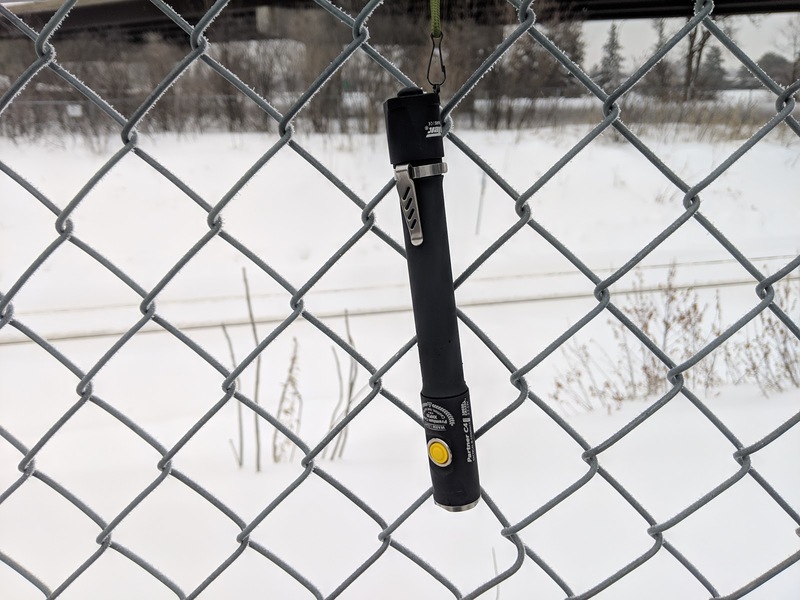 Today I'm taking a look at the Armytek Partner C4 Pro with an XHP35 emitter. This is a somewhat unique form factor - 2x18650 cells in series for a long, slender light, and it's one I've had my eyes on for quite some time. Operations are controlled by a forward clicky tail switch and a side e-switch. The "Partner" product line is all of the 1" lights with tail switches. The standard lineup has only the tail switch and an aluminum construction, and the pro line adds a stainless steel bezel and a side switch for mode control. The lineup is available with a variety of cell options, from 1xAA up to the 2x18650 configuration I'm looking at today. 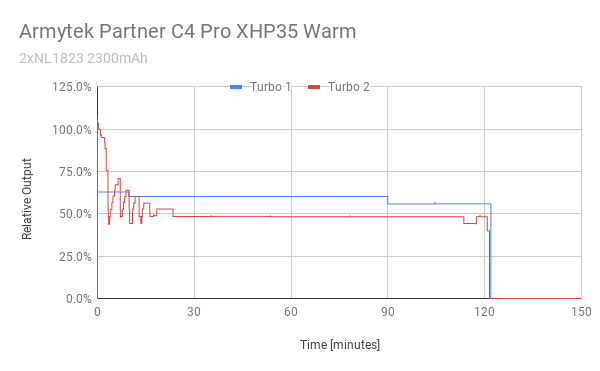 There's also a variety of emitter options - XP-L or XHP35, in either warm or "white" CCTs. 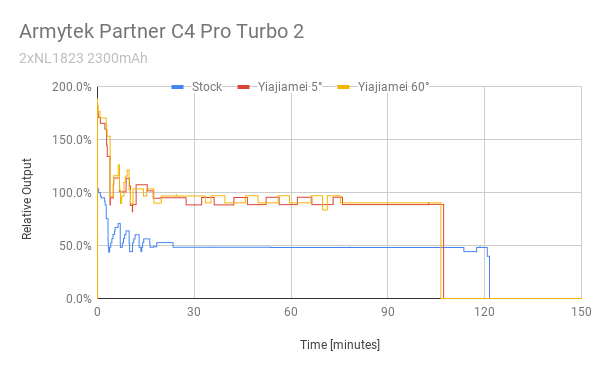 Although I'm reviewing the C4 Pro XHP35 today, much of this will apply to the other lights in their lineup. I initially wanted this light purely for the odd form factor - at the time of writing, it's one of the slimmest lights on the market with this battery configuration. My expectation was that the weird form factor would make it a great add to my collection. Once I got my hands on it, it instantly seemed far more practical than I had originally thought. The size handles extremely well. I think anyone looking for some extra capacity that doesn't need a pocketable light will love this. It would be especially at home on a job site or in a toolbox, where a smaller light might get lost. 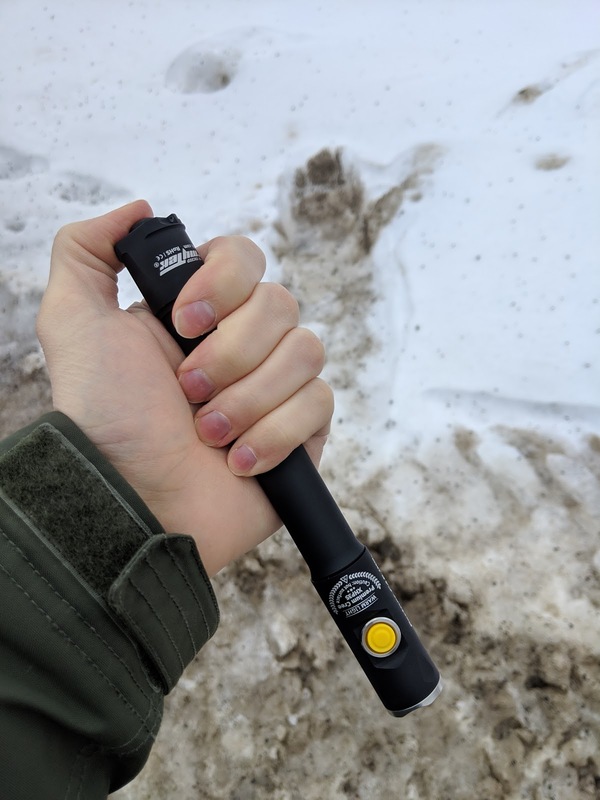 That being said, I do wish the UI had a few more features, and Armytek used the wrong lens in this product. That's a big mistake for a company selling lights in this price range, and it's really unacceptable that they haven't fixed it yet. The light measures 205 mm long, 24.5 mm at the head, and 20.8 mm around the cell tube. Without cells, it weighs in at 83 grams. The light is almost twice the length of a Convoy S2+, but the narrower cell tube gives it a great feel in hand. It's also interesting to see it next to the Nitecore EC4GTS. Despite the larger head on that light, these two have a lot in common - both are dual switch lights using the same emitter and the same cell configuration, but with a very different design. The build on this light is fantastic. The body uses a fairly unique anodizing that's sure to be polarizing - it's matte, almost rough to the touch. It feels a bit like a chalkboard. I like the added grip it gives, but it's definitely not pleasant to handle. It also shows "scratches" very easily, but more often than not it seems to be other finishes that have been abraded by the anodizing. In all cases, these visual markings rubbed right off, and never did I see any lasting marks on the body. The head of the light has a slightly crenelated stainless steel bezel, which holds in place the glass window and the lens behind it. Below the head, there's a few decorative notches cut into the aluminum. The button sits inside a milled notch, which is a great way to keep it flush with the rest of the body and easy to find. There's a matching notch on the opposite side of the head as well. The switch itself has a bright yellow boot, and is held in place with a stainless steel ring. It's an indicating switch, with both red and green LEDs hidden beneath it. The head also has a number of labels on it - one feature Armytek has been known for. The side includes the model and the voltage range the driver supports, which is great information to have on hand - especially for a light like this where the body tube can be swapped with the others in the lineup. The top of the head, near the switch, shows the LED in the light, the CCT, the "HOT' warning label, and what appears to be some olive leaves. The body tube tapers down, and is bare except for a small groove near the tail to hold the included clip in place. The tail of the light has a proud forward clicky switch. This makes it easy to access, but it does mean that the light won't tailstand. Given how long and thin the light is, that's not much of an issue. The tail is also slightly flared and squared off, which help with grip when activating the switch and give the light some roll resistance. There's also a small lanyard hole on the tail. Inside the tail, the threads are anodized. This means you can lock out the light and prevent accidental activation by just slightly loosening the tail. There's a large spring for the negative contact of the light. It's noteworthy that the threads are sealed off with dual o-rings, for added resistance to water. The threads at the head of the light are not anodized. The head of the light contains another spring, this time serving as the positive cell contact. Once again, dual o-rings should prevent any water from slipping into the light at this joint. As I've already said, I found this light to feel surprisingly good in the hand. I like bodies that are narrower than the head and tail, and the anodization on this light adds a lot of grip - so much that I never lamented the lack of knurling anywhere on this light. The slim build helps the light slide into pockets without any issues. Although the light is too long for most front pockets, I carried it in my jacket breast pocket regularly, and sometimes in a back pocket during use. Armytek includes a pocket clip with this light, which I personally can't see myself using all that much. It can only be attached for head down carry, and leaves about 34 mm protruding from the pocket. In the rear pocket of my jeans, the clip sits too far from the head of the light to touch the fabric. In the deeper front pocket, it works just fine. The light also ships with a nylon holster. The holster has a velcro closure to keep the light secure, and elastic sides. Since this is a tube light, the holster works for carry in either direction, though head down seems most sensible. The backside of the holster has a long sewn loop to run a belt through, as well as a small plastic D-ring. Finally, the light includes a lanyard. The lanyard seems to be of good quality, and attaches to the light via a lobster clip and a small key-ring. I'm not a fan of this attachment. It seems to have too many parts, and the clip and key-ring are both thin and don't look like they could take too much force. The lanyard attaches at the tail of the light. The lanyard is quite long, and includes a mechanism to tighten it on your wrist. The modes on this light are dead simple. The tail switch always acts as on/off. Half press for momentary on, or fully click the switch for constant on - this always remembers the last mode. The side switch serves to change modes when the light is on, from low to high. There are 5 modes ranging from 1.7 lumens up to 1675, as claimed by the manufacturer. The highest turbo mode can be configured to a lower 950 lumens by momentarily activating the switch >15 times in rapid succession followed by switching it on for a few seconds. When the light is on, holding the side switch goes into strobe mode. From here, holding again switches the strobe brightness. A single tap of the side switch goes back to the last used constant mode. I found the moonlight mode to be very useful, but I wish there was a shortcut to get to this from off. Some other dual switch lights I have shortcut to low if the light is switched on while the side switch is held down, which would be a great addition to this UI. The light I have here is using a warm XHP35 HD behind a floody TIR lens. Most notably, this light uses the wrong TIR lens, as first noted by Clemence over on BLF. The beam with the stock optic is very ringy in appearance, as opposed to the smooth beam one would expect from a TIR. The stock optic also greatly reduces the output and increases the heat created by the light. I've added some information about swapping the optic in a separate section. It's worth noting that it appears this issue affects all current lights in Armytek's Partner and Prime product lines. Aside from the issues mentioned above, the floody beam is still pretty good for close up work. I like the CCT, and I like this LED. If the lens issue was fixed, this beam would be a winner. The light is powered by 2x18650 cells in series. As with any light with the cells in series, I highly recommend that two married and protected cells are used. The cell tube is a tight fit for the Nitecore NL1823 cells I used, which measure 18.4 mm in diameter. Larger cells would likely not fit. There are springs at both ends of the cell tube, so flat tops should work as long as the positive terminals stick up past the wrapper and they can make contact with one another. The voltage range printed on the head of the light and the product page both indicate that this light supports 4xCR123A cells, though the user manual indicates that 18650s are the only supported cells. 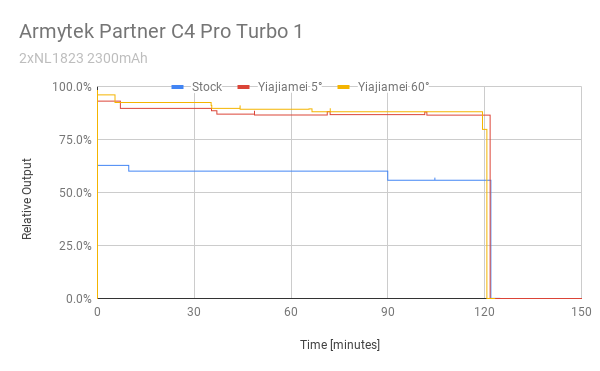 In any case, I did not test CR123A compatibility. 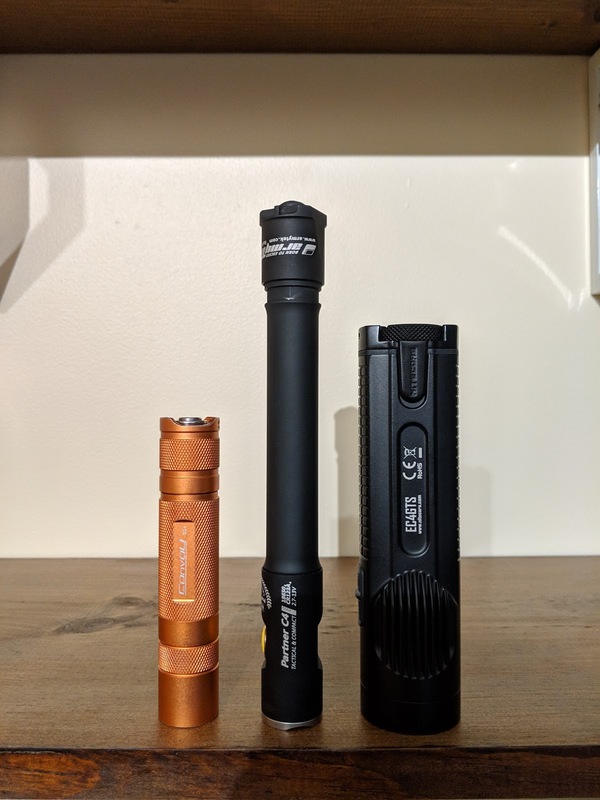 It's worth noting here that Armytek sells various replacement cell tubes that fit this light and would allow you to use a wide variety of alternate power sources. The runtime was tested on turbo 1 and turbo 2. During these runs the light gets extremely hot, but the thermal regulation kicks in to hold the heat steady and prevent the light from damaging itself. The indicating switch flashes to indicate that the light is overheating, signalling to the user that they should switch to a lower mode. Throughout the use, the side switch blinks out every 5 seconds in all modes. The manual claims you can enable or disable this functionality in firefly mode, but I was not able to get that to work. In firefly mode the bright flash of the side switch is quite jarring compared to the dim output, so I hope I can find a way to shut this off in the future. After reading about the issues with the stock optic, u/mcfarlie6996 was kind enough to send over a few optics for me to test - the Yiajiamei 5° and 60°. Swapping the optic is a fairly simple procedure - once the bezel is unscrewed, there's an o-ring holding the glass in place, and then the optic falls right out. I was able to unscrew the bezel with just a nitrile glove for a better grip, but I've heard some other owners report more stubborn experiences. Visually, both of these optics give a far more even beam than the stock. The 5° is also significantly throwier. The biggest difference, however, is the output. I redid the runtime tests with the same cells and the exact same light, changing only the optic lens. As a disclaimer, my test setup and conditions are not professional grade. Factors such as dirt on the lens, variations in room temperature, and the profile of the beam may have slightly impacted my measurements. That being said, I am confident that the bulk of the difference recorded is not due to measurement discrepancy. On Turbo 2, the highest mode, the output almost doubled throughout the runtime. Since there is more energy leaving the front of the light as heat, less is wasted as heat in the head. We can see this as the thermal regulation doesn't bounce around quite as much as the light initially ramps down. Since the light can run at a higher power without overheating, the cells died about 10 minutes earlier. Turbo 1 was fairly stable already with the stock optic, so thermals don't have as much of an impact after the swaps. Since the light isn't stepping down, the time to drain the cells is about the same as with the stock optic. The only change here is that Turbo 1 with the swapped optics measures about as much output as Turbo 2 with the stock optics. Interesting light, and nice review… thanks. Are the replacement optics available for purchase somewhere? You should be able to find them on AliExpress.